This is the fourth audio blog lesson in the Get Edified! Marketing and Sales Series, a complimentary series of lessons for entrepreneurs, business leaders, and anyone who sells a product or idea. Whether you’re selling to make a living or seeking to convince someone to adopt your idea, these lessons apply. In short, this series is for everyone because everyone sells in some form or fashion. Marketing has been around for centuries in various forms and functions. Not much has changed, really, except that someone will come up with a new flashy term for one aspect of it, and that becomes the new go-to trend that everyone follows. There is no single formula for marketing success. Everyone, it seems, has a recipe – a blueprint – a special tool they use, or a certain platform or methodology. The fact is, most of them will work. But they may not work for you. I learned this lesson the hard way once. I hired someone to write some marketing emails for me who didn’t know my voice, didn’t know my people, and didn’t share my values. Now if you know me, you know that I would never say, “Hey, Dude,” and certainly not in the context of a serious email. My people picked up on this incongruity immediately and commented to me about it. Many unsubscribed from my list. Others thought it was spam. Now I’m not saying you have to write every single article; but you must be sure every single article is genuine to you and meets the needs of your audience. This is the key: authenticity and serving a need. If you can master only two qualities in your business, master these. As you serve your people through marketing, there are four keys to remember. Many chase the countless marketing tools that are out there. They are like shiny objects, each claiming to have the key to your marketing success. I am here to tell you, the key to your marketing success is…YOU! It is your focused purpose, propelled by your applied passion, serving your people, and guided by your process. The tools and methodologies of others can be useful, but you must first start with these four keys. 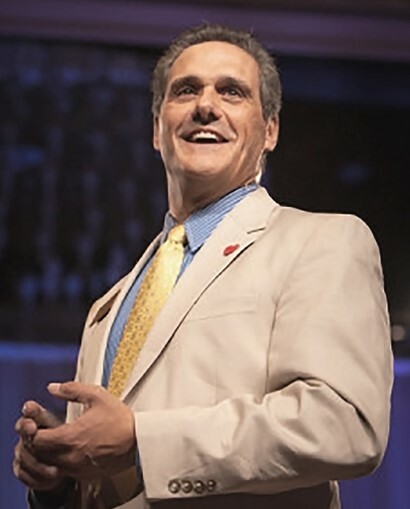 Beyond the fact that you have to make a living to supply your needs and those of your family, or to provide a measure of freedom and schedule flexibility…what is the “why” of what you do? I want to change the lives of children. I want to change the direction of organizations to make them better places to work. I want employees to feel fulfilled, respected, challenged, and compensated fairly. I want customers to feel validated as human beings, in part because of the way they’re treated at my business. I want to make my part of the world a better place by serving people. I want to restore neglected treasures – in people and places. Yes, you must make money in business; or you have no business. But if that is your sole focus, there will always be something missing. And your potential clients have an innate detection system that lets them know when they’re being sold to and when they are being genuinely served. If your answer stops at “because of the money,” I would strongly suggest you keep searching. If that’s as deep as you go, history tells us that passion won’t last, because you’ll get a little money, and then your need for the money will dissipate, and there goes your passion for what it is you’re doing. And when passion goes, so does your ability to do what you are doing with authenticity and effectiveness. I’m not much of a fisherman. I fished quite a bit when I was a little kid, but it was basically a matter of dropping a hook in the water and reeling in whatever happened to hit the line. There were all kinds of fish in Boston Harbor. But I’ve been on fishing trips with some professional fisherman. They are different. They understand the behavior of the fish they’re going after. When you are on the charter, they know where and when to go. They know what bait to use. They know what behavior stimulates that particular fish, whether the bait needs to be stagnant and just sitting, or moving. They know if the boat should be still or moving. Unlike me, they’re not just dropping the hook in the water and waiting for something to swim by and bite it. They know precisely what to do. Now people are not fish, but marketing is a bit like being a professional fisherman. You have to know your people and their needs and behaviors. You have to know where to find them. You have to know when to reach out to them. Otherwise, you could be wasting time and money with no real knowledge of how to actually reach your people. It may be fun, but could end up being a costly hobby with nothing to show for it. Your goal should be to serve your people. But to reach them, you must know their behaviors and where to find them. You have purpose. You know the needs of your people. Now what is your plan for reaching them? Even if you have a software solution that will solve major issues for people who respond to your Facebook ad without knowing you, you must first build a relationship. Whether online or offline (or, ideally, both), to be effective at marketing, you must build relationships. And to build, you must have a plan. The marketing funnel is nothing new. It started as early as the 1800’s. The mechanisms have changed, but the idea has deep roots. You deliver a sample or something of value. You give people a chance to know you, and you get to know them. You have a conversation to determine if what you do is of value to them in serving a need. That is marketing and sales. If your “plan” is to do what everyone else is doing just because they are doing it, you could end up wasting a lot of time and money. Learn from some of the best examples that are out there, then create a plan that fits you and your people. Having a plan and knowing your purpose and your people are all important. But without this last step, no one will be served by what you do. You must take action! While that sounds simple, I meet people every day who don’t take action. For some reason or other, they hesitate. The point of action is usually where the Gremlins get you. One distinguishing characteristic of a successful business leader is action. They will think and plan…but they are normally also the first to take action. When I have prospective business coaching clients, I can usually tell who has the most potential by how quickly they take action to engage and do the needed assignments. 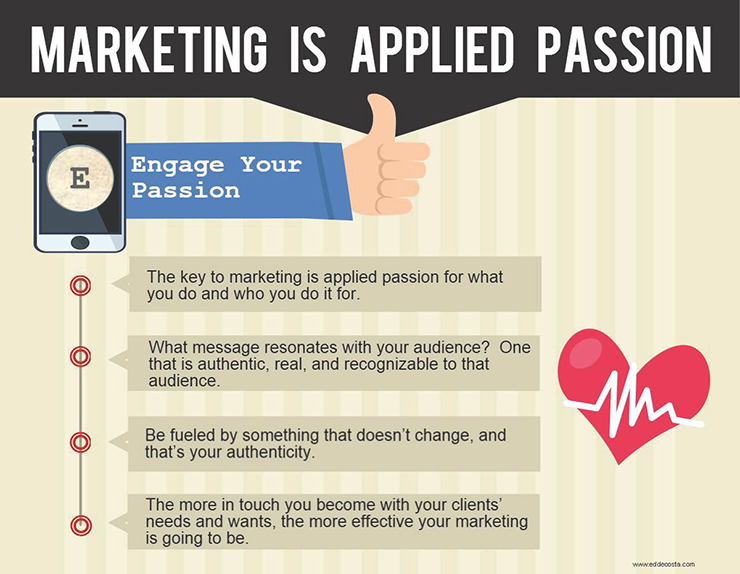 Marketing is applied passion. It is purposeful action. You do have to take action. In marketing or any aspect of your business, keep these four guideposts in front of you at all times. They will serve you well. Focused Purpose: Why do you do what you do? Serving People: Whom do you serve? Guiding Process: What is your plan? Applied Passion: What actions will you take? Wow – we must be on the same wave length this week! I’m in the process of creating a new sales funnel and doing the research to make sure I do the right things and not just do “something.” Great questions!